Announcing the winners of the eighteenth ever Right Place Photo Caption Contest! Presenting the top ten captions for this picture from Gary Hershorn/File/Reuters via Yahoo! #10: "Hey, George! Come on over and bring your friend Karl! I've got a surprise for yoooooouuuu...."
#9: And just think... properly inserted, it will give Democrats a spine! #8: Babs Boxer displays a souvenir from her early days as a knee-capper for the Oakland Crips. #7: Sen. Boxer rings the dinner gong and then moves to a safe position as not to get in the path of "Hungry Teddy." #6: "I've painted Karl Rove's head like a watermelon, Gallagher. Now come up here and get your hammer!" #5: "Arrhhhh!!! What's in your wallet?" #4: People paid little attention to Babs, Dianne, Hillary, and Olympia's weekly croquet matches... until that mysterious wave of "suicides" swept the Senate. #3: "I will wield mighty Mjollnir to crush Jormungand's head at the final battle, Ragnorak... or use it to bring order to the Senate... Frankly, the former is probably more realistic." 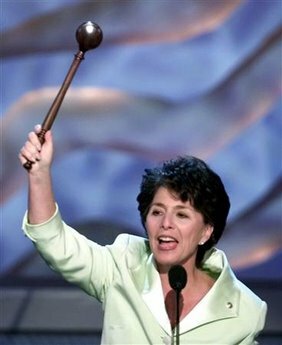 #2: "How much am I bid for this priceless artifact --- the actual Ugly Stick Barbara Mikulski was beaten with!" #1: Going... going... gone! The Democrats' integrity - Sold to George Soros for $30, a walk-on in Michael Moore's next movie and a Tic-Tac! BONUS: Chris from Lucky Dawg News has produced a photoshop entry for this week's contest. While very clever, as usual, it might be considered a wee bit too much for some of our more sensitive readers. It has to do with the subject of partial-birth abortion. With that in mind, those wishing to view it can find it HERE.